Ever wanted to see Japanese manga students at work? Are you a fan of anime art? Are you an artist anime yourself or just enjoy artist alley? Come and join the students from J.A.M. (or the Japanese Animation & Manga College) On Saturday December 1st at Little Tokyo’s Miyako Hotel. JAM are bringing several of their students from their art college in Japan over to Los Angeles for a ONE DAY fundraiser event. If this is anything as their first fundraiser, last year’s, there’ll be freebies from JAM (Art samples books, DVD Animation demos, ETC) in addition, you’ll be able to purchase art, hangout with manga students, watch live drawings, get your a portrait drawing, photo ops and more! Last year, we stumbled on their first fundraiser by chance and had so much fun, we figured we’d share this event for more anime fans to join the fun! See you there! & as always, we’ll be bring coverage from the event. Since 2013, Gudetama (ぐでたま) made its debut as a Sanrio character. Gudetama became an instant STAR with Gudetama theme cafes, stores and even a Gudetama themed menu in Los Angeles back in 2015. Gudetama’s origins begin with a character design contest held by Sanrio back in 2013, coming in 2nd to Kirimi-chan. Fastword to 2018, Gudetama’s creator/designer, AMY (Emi Nagashima) visits the Sanrio store in Little Tokyo, Los Angeles, making this her first visit ever. Gudetama fans stood in line to receive a signed drawing of Gudetama from AMY. As AMY made a special appearance in Los Angeles, Aggretsuko creator/designer visited the Sanrio store in San Francisco for the continuation of Aggretsuko’s Den Of Rage event. With Gudetama & Aggretsuko becoming instant stars & both characters getting their own TV series (Gudetama: TBS & Aggretsuko: Netflix), it’s only a matter of time before Sanrio develops yet another super cute and adorable character we can all be be obsessed with. Who’s your favorite SANRIO character? Comment below! Ronin-Expo was held on June 02 of 2018, at the Japanese American Cultural and Community Center in Little Tokyo, Los Angeles. So what is Ronin-Expo, you may ask? Ronin-Expo is a celebration of Asian culture, this includes anime, video games, movies, & even a bit history of Japan itself. What makes this expo so interesting though, is the fact that it’s in the center of Little Tokyo district in the city of angels (Los Angeles). This makes it a diverse spot for Ronin Expo to be in, as attendees can further explore Little Tokyo by visiting the surrounding museums and local restaurants. Here are some more pictures from the event including: cosplayers, event guests, attendees and staff members. Felt like you missed out? Don’t worry, Ronin Expo will return spring 2019, so mark your calendars and take a trip to Little Tokyo, Los Angeles & make sure to stop by Ronin-Expo! See you at the next Con/Expo! Thanks for reading/watching our interview with Sarah Williams, now here’s your chance to WIN an autographed print of Felix Argyle! All you have to do is, leave a comment on the interview video & subscribe to our YouTube Channel! Refer to our Giveaway rules for more information. Special thanks to RONIN-EXPO & Danny Gonzalez for the opportunity to attend RONIN EXPO! Aggretsuko’s Den of Rage: Why do you like Aggretsuko? Since the beginning of Aggretsuko Den of Rage event, we’ve been covering the event as it took place in Little Tokyo in Los Angeles, CA! Aggretsuko made another LIVE appearance, in Little Tokyo’s Sanrio store in Los Angeles. As you may remember, Aggretsuko debuted in 2015 and quickly became a sensation! She made her first LIVE appearance in Los Angeles on September of 2017. In honor of Aggretsuko newest Netflix series, Little Tokyo’s Japanese village Sanrio store set up an ‘office’ pop up with Aggretsuko herself in furson! MISSED OUT? EVENT is still ongoing, check the dates below! AFTER MAY 12TH Aggretsuko will NOT be making an appearance at Little Tokyo’s Sanrio store, however, the pop-up office will still be there until MAy 16th alongside limited official Aggretsuko merch! HOLD ON, THERE’S A CATCH! ** Limited edition Aggretsuko x Amoeba live screen printed t-shirt or tote bag. =Choose from two exclusive Aggretsuko x Amoeba designs and colors! For more information, please refer to the Amoeba Music event page on Facebook. Aggretsuko IS COMING BACK TO LITTLE TOKYO, LOS ANGELES! Hosted by Sanrio Japanese Village store, Aggretsuko will be making an appearance once more from May 4 – May 16 2018 May 28th 2018 (Event has been EXTENDED, more info here). Beginning Friday, May 4th at Sanrio Japanese Village until Wednesday, May 16th, enter this Sanrio pop-up for first dibs on a limited inventory of official Aggretsuko merch, photo ops and appearances from Aggretsuko herself! More information can be found on the event page here. Artist Chiaki Harada (原田ちあき), made a special in-store appearance at Fickle Wish in Little Tokyo Los Angeles. Chiaki Also has her own manga out titled, “Chiaki Harada’s Suspicious Diary” which is available for purchase on her site or on Amazon. Did you miss out this event? Want Chiaki Hadara Merch? Visit Fickle Wish at, Ficklewish.com! Find out about more Fickle Wish events by Liking their facebook page. Follow Chiaki’s artwork via Twitter, instagram and website! Aggretsuko’s 1st U.S. Appearance ! On January 2017 SANRIO announced their newest character, Aggretsuko (アグレッシブ烈子)! Although the character debuted in 2015, Aggretsuko began appearing on social media in early 2017 & it seems she quickly found fame among Hello kitty fans. In the recent months since her appeared on social media, she has gotten a huge following, much like GUDETAMA back in 2013. She recently made her first U.S. Appearance at the newly re-opened Sanrio store in Little Tokyo in Los Angeles! Along with new Aggretsuko merchandise. Aggretsuko merchandise can also be bought on the official site. Judging by her popularity, there might more Aggretsuko themed events coming soon! Who YOUR favorite SANRIO character? Comment below! LADYBABY a famous band that recently came into light with, currently 9,765,665 views on their music video, Nippon Manju. The video went viral ever since it’s release earlier this year. Since then, the band has played numerous shows in japan and most recently at New York City Comic Con and Los Angeles. LADYBABY is the second KawaiiCore band to have spawn out of Japan, along side BABYMETAL (formed in 2013). 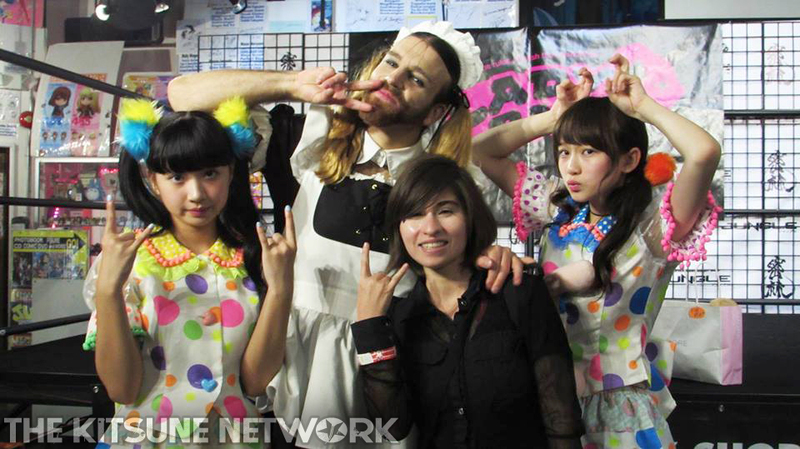 Created by ClearStone to promote their costumes, LADYBABY consists of LADYBEARD, Rie Kaneko and Rei Kuromiya. Their music genre? KAWAIICORE! Which is a mixture of Heavy Metal and Japanese pop music. Ladybeard is an Australian Professional wrestler, heavy metal vocalist and party rocker. Labled as Japan’s Andrew W.K, Ladybeard first appeared in the rings of Hong Kong’s pro-wrestling in 2009. After gaining popularity as a wrestler, he expanded into the music industry. In 2010, he made his debut in a heavy metal band & while touring, he finally fulfilled his dream by going to japan for the first time. After returning to his homeland, Australia, he returned to Japan in September 2013 and It wasn’t until March 2015 when he was asked to form, LADYBABY. Rei Kuromiya, the youngest of the group and winner of Miss iD2015 Grand Prix, She is the vocalist & guitarist of her own rock band called, BRATS and is currently training to be the lead role in a crowd funded movie along side her sister, Aya Kuromiya who is also in BRATS. Rie Kaneko former Miss iD2015 Grand Prix winner and actress. Aside from working with LADYBABY, she also worked with HAJIMETAL as the lead vocals in the song GIRI GAL. 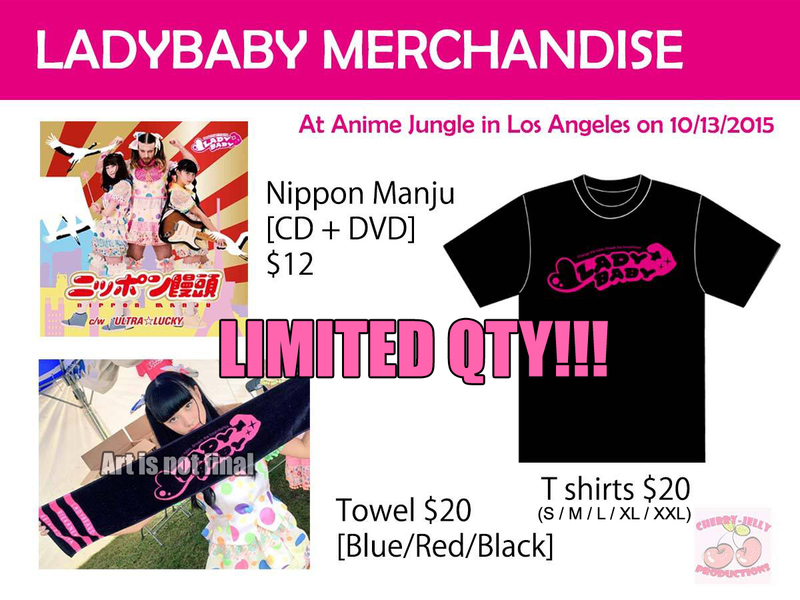 On Oct 12 2015, LADYBABY made an appearance in Little Tokyo’s Anime Jungle, where they performed a mini-concert & played their hit single, Nippon Manju, Along with, upcoming singles which are set to be released December 2015. A new music video has been confirmed to be released, which was filmed in Japan, New York City and Los Angeles. 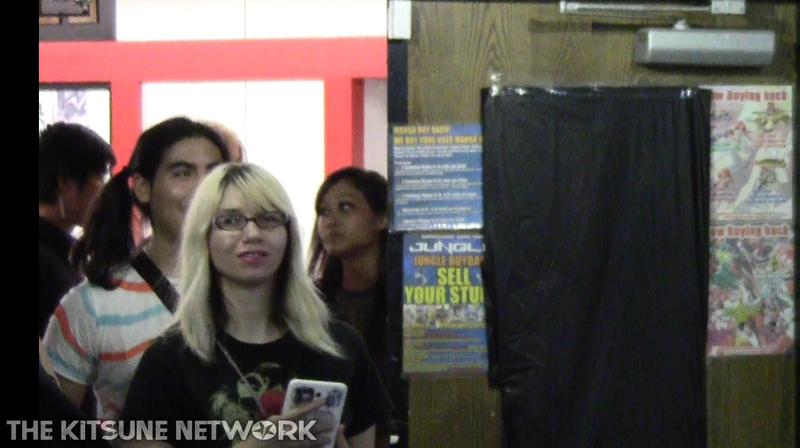 Fans stood in line since 11am just to see LADYBABY, with one fan following LADYBABY tour dates traveling from Japan to New York and finally to Los Angeles! Now that’s dedication! About 200+ fans filled up ANIME JUNGLE to watch LADYBABY. 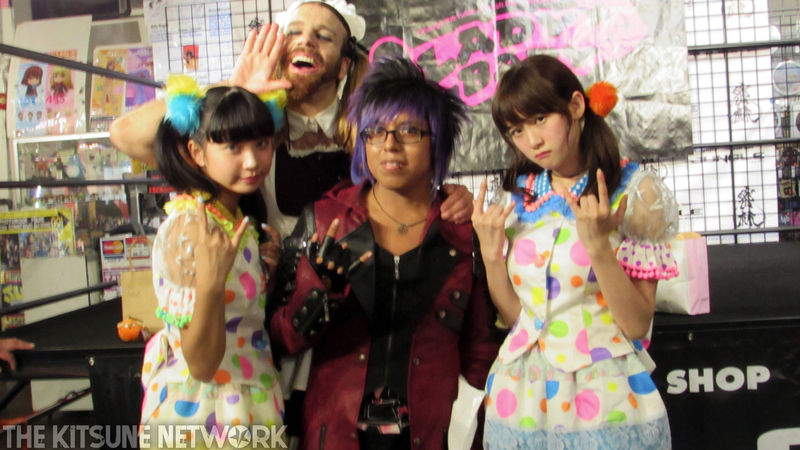 And of course, just like most events, we got all got our chance to take a photo with LADYBABY! Remember to buy the CD+DVD album!